Many people are worried that a pre-emptive strike by Israel on Iran this year is inevitable, as any delay would mean that Iran would complete their objective of building a nuclear bomb with which to annihalate the Jewish state. It is thought likely that following such a pre-emptive strike, Iran would launch a spirited counter-attack unlike the last time Israel hit their nuclear sites. 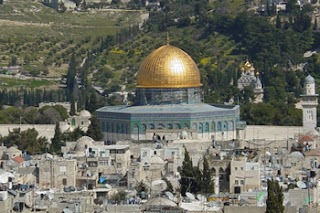 Is it, I ask myself, an opportunity for the Israelis to accomplish one of their known goals- the total destruction of the Dome on the Rock. Archaeologists have been burowing beneath the structure for years, despite Palestinian opposition. The rock is honeycombed with tunnels and excavations that can be packed with explosives under cover of darkness and detonated as if it were destroyed by an incoming Iranian missile. A spent missile body could be brought in and planted to add authenticity to the story. TV pictures around the globe would portray this as an Arab 'own goal'. Naturally, neutral observers would be banned from verifying the story and all evidence of a deceit destroyed in the rush to build the new Jewish Temple on the site. Being neither Arab or Jewish, my observation is without prejudice, other than to say that this action would be entirely due to man and not Allah or Yahweh who despite the 'omnipotent' tags are, as ever, irrelevant.